Stretch your legs from time to time will make you able to ride much longer before getting tired. 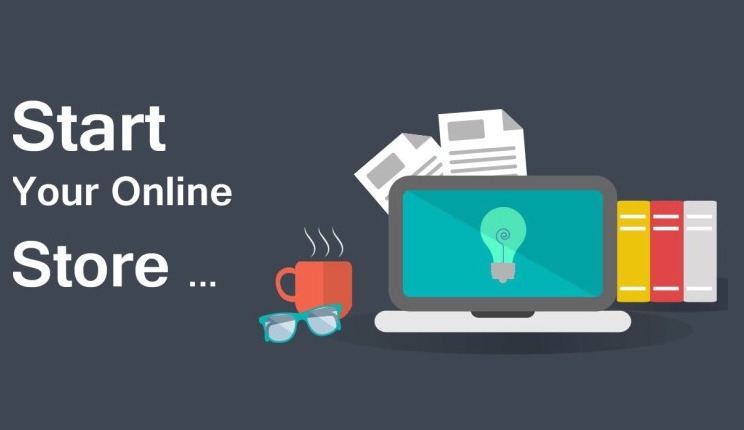 How to setup your online store on egybikers.com. Login as a dealer on egybikers.com and then click on Create store. 1- Add your brand, pickup address, contact person name and phone. 2- Receive a validation phone call. 3- Manage your eStore directly from your control panel. egybikers.com signed an agreement with Ready 2 Ship Logistics Co. to deliver its online sold items to its customers ensuring a timely, accurate, and quick delivery. Ready 2 Ship Logistics Co. is a growing logistics company providing Door to Door road transport services. egybikers.com and R2S Co. signed a cooperation protocol to deliver door to door any item sold off the newly launched phase one e-store of the egybikers.com website specially built for motorcycles enthusiasts in Egypt. egybikers.com and R2S Co. have put together a seamless semi automated delivery system from the moment the customer places an order, up to the minute the ordered is delivered to the customer’s door step. The system ensures maximum accuracy, comfort, and swift delivery to all egybikers.com e-store customers. Both companies have agreed to only test the system they established based on cash on delivery system as a phase one to be later developed into a fully automated delivery and payment system. egybikers.com has launched its mobile version website on Thursday 20 July 2017 with a friendly and optimized interface design on mobile device. The phone’s version is Similar to an application, that will enables the user to browse easily and comprehensively all what is published on the online version. This shows great efforts to bring convenience to customers when accessing Internet from mobile device is becoming a popular habit nowdays. As more and more web users turn to portable and mobile devices for their browsing, it was the obvious next-step for egybikers.com, keeping side by side with the latest design trends. Simply log onto egybikers.com on your smart phone and you will automatically be redirected to the mobile version. “We have finally signed and launched the Mobil Extra 4T banners on egybikers.com website. Starting September 2016 Mobil oil will be featured on egybikers.com as main sponsor.” Says Karim Taraboulsi, founder and CTO of egybikers.com, Egypt’s premier motorcyclists’ platform. Both parties are joining efforts to launch Egypt’s first of a kind service that promotes, sells, and delivers motorcycles’ and scooters’ engine oils to motorcycles’ riders throughout Egypt. Fady Noeman, Africa & Middle East PVL Field Marketing Advisor of Exxon Mobil clarified that “Mobil started targeting the motorcyclists’ market segment earlier in 2015, and has successfully launched on the ground campaign during the Biker Zone 2016 with 2 key products, the Extra family: 2 T and 4 T.” Exxon Mobil and egybikers.com are expected to launch a series of promotional campaigns and partnerships with oil changing and servicing parties in the coming few months. 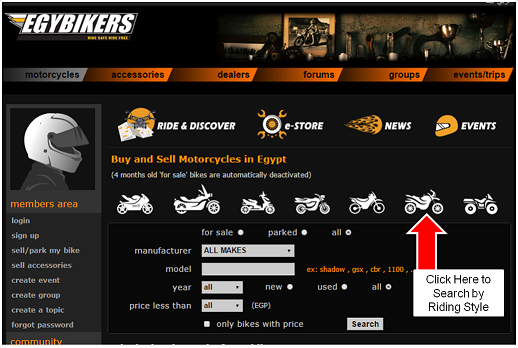 Now you can easily “Trade” or “Rent” a bike thought-out egybikers.com. egybikers.com Launched Their New Online Store. egybikers.com is launching its certified and secure (SSL) e-store with many brands and practical features for bikers and other visitors. egybikers.com have secured 3 different express companies to cover the entirety of Egypt and reach our e-store customers wherever they are; ARAMEX, R2S Logistics, and Runners Express. Moreover, you can choose your method of payments; by credit card (in cooperation with Arab African International Bank), by cash upon delivery (COD), or with Credit Card upon delivery (with PayMob). egybikers.com brings you world class original brands directly from their distributors to your doorsteps; AGV Helmets, YUASA Batteries, COBRA Accessories and Parts, DUCATI Promotional Items, SBS Brake Pads, K&N Filters, NGK Spark Plugs, and Karcher Cleaning Machines. Our team is working on adding very soon DIANESE riding gear, and BRIDGESTONE tires. Finally, if a spare part or an accessory item is missing on egybikers.com e-Store, you can go to the “pre-order now” section and write to us. Our team will make sure your needed piece is ordered and delivered to you as soon as possible, all while following up with you on email and telephone. Please read well terms & conditions and our website rules. Sign in to egybikers.com with your Facebook account. You can finally sign in to egybikers.com with your Facebook account. If you are a savvy Facebook user and egybikers.com fan, you can now Register to egybikers.com with your account. Our team has registered as Facebook developer and went through the integration process to ensure your experience is smooth without problems. We only collect your public info; name, email, birthday, city, and profile picture URL. You can now sit back and enjoy a very smooth experience between both your accounts. You can now sort motorcycles by your favorite riding style, just by clicking on the corresponding picture. The list will come out with the newest posts on top. Of course, the old search feature is still functional by brand, year, model, and/or price. Important Note: For those who post motorcycles for sale, there is now an important change: The "post date" and "updated dates" are both showing to everyone. The Arabic version is now up-to-date and running very smoothly. We are also developing the User Interface (UI) to be fully Arabized very soon. You will also be receiving Arabic promotions and newsletters soon inshaAllah. For the first time in Egypt and the GCC, egybikers launches “RIDE & DISCOVER” the world. “RIDE & DISCOVER” is group of handpicked tours to exotic destination around the world with world class tour operators to ensure egybikers clients’ satisfaction. egybikers has an exclusive association with Egypt’s top Destination Management Company: EMECO Tours Egypt. EMECO will secure all logistics; ticketing, visas, travel insurance, additional hotels reservations. EMECO will handle all reservations in Egypt and Emirates. Moreover, one of the tours is organized 100% with EMECO in Bulgaria insuring a unique experience around the Dead Sea in the Balkan region. egybikers.com have finally launches its e-store (soft launch) selling innovative and interesting items to its web clients ranging from motorcycle and home care equipment to hand tools, motorcycle tours, and safety gears. You can check the items on sale on the new egybikers e-store by clicking here or by finding and clicking the e-store button on the newly designed navigation menu. 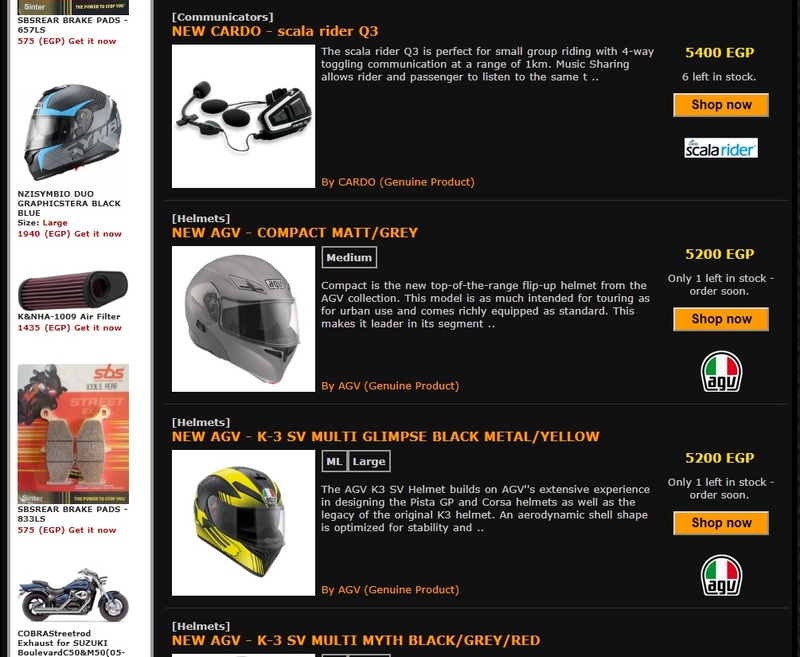 egybikers’ e-store is equally accessible through the old link on the accessories tab on the main menu. 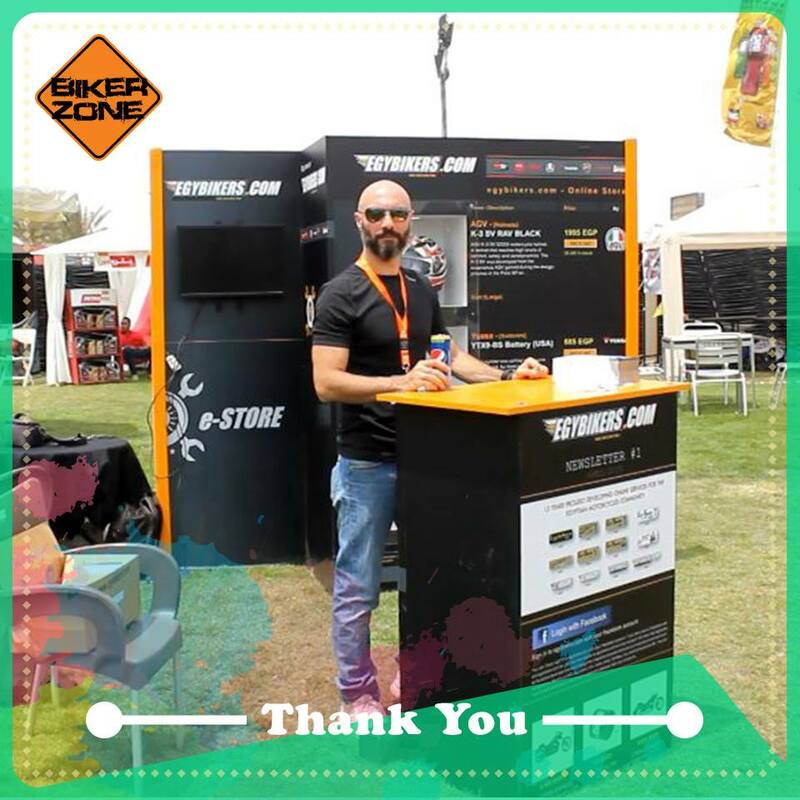 egybikers have partners with many famous names to bring to its clients the best products ranging from specialized cleaning equipment and products, up to safety gear and riding accessories. egybikers is planning to integrate the other accessories sellers into its e-store as phase two creating one of Egypt’s largest online accessory stores dedicated for motorcycles enthusiasts. Finally, egybikers have secured safe and quick delivery with a select door to door partner: Runners Express Co. Egypt. All sales in phase one are cash on delivery to ease the process and assure our clientele. Runners Express Co. is a growing logistics company providing Door to Door road transport services. egybikers.com and Runners Express Co. signed a cooperation protocol to deliver door to door any item sold off the newly launched phase one e-store of the egybikers.com website. egybikers signs a dealership agreement with Al Bassiouni Co. the Egyptian sole Distributor of the German cleaning equipment manufacturer to market and sell their equipment on egybikers.com to the Egyptian market. egybikers have chosen a select range of equipment and cleaning products to market and sell on their website for motorcycle enthusiasts to clean and maintain their motorcycles, homes, and gardens with the latest KARCHER German technology. Karcher equipment famous for its European manufactured equipment and cleaning products made for specific household tasks with best European components and know how to ensure the longevity of the machine doing its specific task. Today, in a modest ceremony at the city stars center – Heliopolis, Ms. Shahira El Terkawy –Marketing Manager of CASTROL oils sae (TAQA), has co-signed with Mr. Karim Taraboulsi owner and MD of egybikers .com a 6 months exclusive sponsorship agreement up until the end of 2015. “egybikers extraordinary traffic and unique position as Egypt’s unique hub for the motorcycles’ community is one of the main reasons we have taken this step” Said El-Terkawy. Both partners have agreed to drive the traffic from egybikers to CASTROL oils facebook page through meticulously designed banners and a video. With many more planned activities in the coming few months to look forward to, the collaboration between the parties is looking very promising. We have been certified by Goddady as safe and secure website. You can now do any type of transactions (data/ financial) in all safety without any worries.